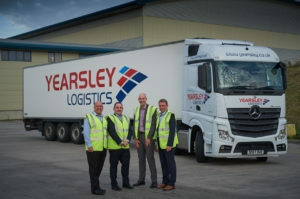 Yearsley Group Ltd, the temperature-controlled logistics specialist, has been acquired by Lineage Logistics Holdings, the US company that also owns Partner Logistics. Yearsley Group directors (Left to Right) Jonathan Baker, Ian King, Tim Moran and Phil Whitworth. Yearsley Group Ltd is the Guernsey-based holding company for Harry Yearsley Ltd, which turned over £203 million in the year to 1st April 2017. Operating profit was £5.4 million. Lineage is owned by private equity investor Bay Grove. It was founded in 2008 and is based in Novi near Detroit. It operates more than 100 facilities in the US totally over 600 million cu ft.
“We see tremendous alignment between our two organisation, not only in our capabilities to diligently serve customers’ extended supply chains, but also in our dedication to supporting a values-based culture that empowers our growing international workforce,” said Lehmkuhl.